One of India’s most iconic brands Amar Chitra Katha, which taught Indian history and mythology to countless Indians, has been acquired by a start-up promoted by a former McKinsey consultant and a stockbroker that hopes to cash in on the growing demand for India-centric content. Amar Chitra Katha Pvt. Ltd owns brands such as Tinkle comics, Amar Chitra Katha and Double Digest. Around 2.6 million copies of its comics were sold in 2006. Amar Chitra Katha comics were launched in 1967; the first issue was Krishna. Since then, the imprint has released 430 comics. To date, some 86 million copies of Amar Chitra Katha comic books have sold globally. Patil, 36, said he grew up reading Amar Chitra Katha and Tinkle, an extension targeted at young people that IBH launched in the 1980s. “When I was based in the US, I found out there were many people who were interested in comics based on Indian culture and characters," Patil added. Padmini Mirchandani, publisher, IBH, could not be reached for comment on Wednesday. However, Patil said that IBH will retain a minority stake in Amar Chitra Katha Pvt. Ltd. He added that IBH wanted to focus on its core business, distribution, and not on content. 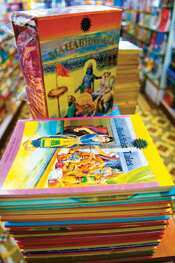 ACK Media hopes to reissue around 200 titles of Amar Chitra Katha books that aren’t in circulation. The company also hopes to target international audiences. “The international markets is as big as ours (India) and the NRI segment is one of the least exploited. We hope to generate around 20% of our sales from these markets through both our physical and online streams such as our online store", said Patil. Details of Amar Chitra Katha Pvt. Ltd’s revenues, and the split between local and export markets were not disclosed. Patil added that his company is “looking for more acquisitions." The global market for comics is valued at around $330 million. Figures for India are not available, but the market is likely to be small. Virgin Comics, promoted by Gotham Comics and Virgin group’s Richard Branson has been trying to sell India-centric comics within and outside the country. It, too, has plans to leverage this content and move into games and movies.